House is a soap opera. Of course it's not really an "opera" in the musical sense nor is it sponsored by a soap company. It is an episodic weekly television drama which details the continuing experiences of a group of characters as their lives constantly evolve and revolve. Each episode hangs on some inexplicable medical mystery which, inevitably, gets explicated. Over the last few months, several times a week, Leslie and I have spent some of our quality time watching the series Jeeves and Wooster, an English television production from the early 90s based on the characters and stories of P.G. Wodehouse. Jeeves, the talented, discreet Gentleman's Gentleman, is played by actor Stephen Fry. (When I first saw Fry as Jeeves I thought he was too young. Now I'm 15 years older and he seems just the right age.) Bertie Wooster, the young, carefree, rich, puffin-headed bachelor, is played by Doctor House, I mean by Hugh Laurie, using his own genuine English accent. Leslie and I both adore Jeeves and Wooster. We regret they only made 23 episodes. The action happens in the 1930's, mostly in England, occasionally in New York City. There's a steady stream of gorgeous architecture, lavish apartments and hotel-size estates. There's another steady stream of gorgeous vintage automobiles. The costumes, especially the men who run around about half the time in tuxedos, are also, well, gorgeous. Nice theme music too. As adapted by Clive Exton, P.G. Wodehouse's plots are no less predictable than contemporary television, but they are much funnier. Most revolve around someone wanting to or not wanting to get married, pretending to be someone else, breaking and entering in order to steal some insignificant object, or attempting a hare-brained scheme for getting rich or out of debt. All of them involve Bertie bumbling his way into embarrassing social difficulties from which he is, in the end, coolly extricated by Jeeves. Wodehouse's characters fall into clear categories. The upper-class women include Bertie's domineering Aunts and domineering marriageable women friends and even a few school girls in training to be domineering. The upper-class men include a host of Bertie's ineffectual neer-do-well friends (who repeatedly say things like "Isn't she the most beautiful woman you've ever seen, Bertie? "), a few crusty older men who repeatedly threaten Bertie with bodily harm and even a few schoolboys who repeatedly cause mischief. The lower class characters include waitresses, constables, butlers and other valets, con artists and rich American businessmen. These parts are brought to life by some fine English actors. It's disconcerting when certain continuing roles are played by different actors in different seasons. 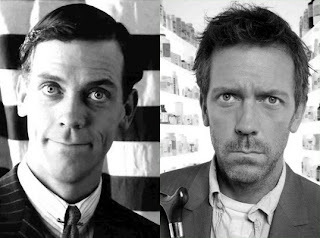 And not one of them comes close to the quality of the American speaking accent which Hugh Laurie does in House. Probably English television audiences don't notice the difference. Of course, the real weight of every episode is carried by the two principal actors, Fry and Laurie. Their marvelous performances consistently convey the ridiculous in the most sublime fashion. Here's a great example of the two of them together. In this clip Bertie tries to sing a current popular tune (which you'll recognize) but typically must rely on the help of his ever-so-tactful valet to finish the job. Did the world of Jeeves and Wooster ever really exist? Most doubtful. I think Wodehouse was doing a fine job of writing parody. These days it's impossible to judge what bits of this television series might fairly represent those historical times. Two things come through from the scripts, however. First, there were distinct differences between English social classes. There was also a great inequality in the distribution of wealth; certain people were fantastically wealthy. According to this, in 1936 53% of the total wealth of England was held by just 1% of the population. While the upper-class wealth of Bertie Wooster's time would eventually decline over much of the 20th century, the wealth of the American elite today is climbing steadily. Maybe that's why we perceive the English wealthy as idle slackers and the American wealthy as greedy over achievers. It's not just a saying these days that "the rich get richer and the poor get poorer". Today it's more like an actual law. I think that the U.S. of 2011 needs our own P.G. Wodehouse. We need an author or television producer who can parody the amusing day to day lives of super-rich people. Why shouldn't there be a television show to make it clear how people like Bill Gates or Warren Buffett who have billions of dollars aren't close to being capable of muddling through their own lives, or even to mixing their own martinis, without the help of a faithful, discrete, patient, intelligent servant such as Reginald Jeeves? I propose that such a show would make many less-than-wealthy Americans more accepting of the obscene disparities of wealth in our country and of their own place in the financial hierarchy. You know, if we can't do anything else about the problem of the ultra-wealthy, at least we should be able to have a good laugh at their expense. Last fall I attended an LA Philharmonic performance of a large work for chorus and orchestra - Graffiti by composer Magnus Lindberg. The interesting text was created from inscriptions discovered on walls of the buried Roman city of Pompeii. These have remained unchanged since molten lava engulfed the city way back in A.D.79. 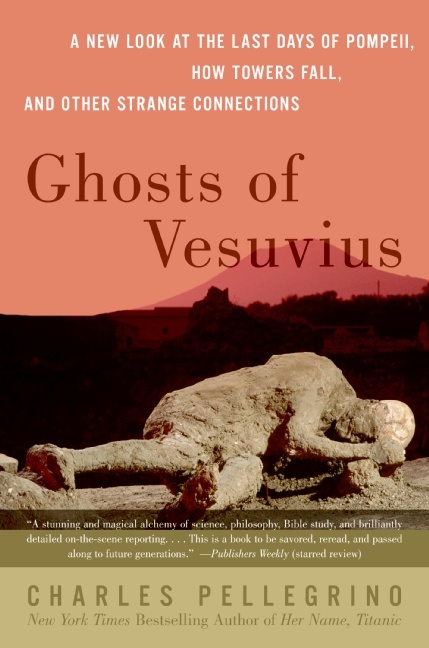 Later I saw Ghosts of Vesuvius by Charles Pellegrino on a stack of Leslie's books. I thought this might be a good way to learn more about the graffiti of Pompeii. I just finished the book. I was wrong. A new look at the last days of Pompeii, how towers fall, and other strange connections. Ghosts of Vesuvius did tell me just a wee bit more about graffiti in the cities of Pompeii and Herculaneum. Plus there was a lot of other fascinating information about Roman life, history, customs and technology. I learned, for example, that in Rome there were eight-story apartment buildings with plate glass windows and sprinkler systems. Roman inventors were working on steam-powered ships. And sunken Roman galleys have been found in places like Brazil and Venezuela - but scientists have not been allowed to study them closely because some people don't want Christopher Columbus challenged as discoverer of the New World. Lots of stuff like that. the sinking of the Titanic, which the author had previously studied up close in a deep-sea submarine and then written a book about. "Very interesting and compelling reading. A killer. 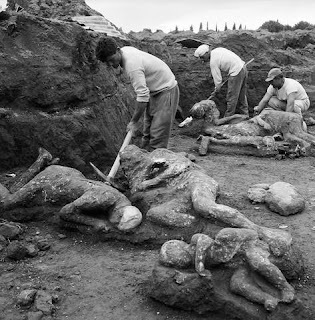 Makes me want to do a movie about Pompeii." -- James Cameron, award-winning producer and director who has optioned screen rights to Ghosts of Vesuvius. No, James Cameron is not crazy. Ghosts of Vesuvius would make a great blockbuster movie very much in the mold of his movie Titanic. That's because of two riveting sections of storytelling in which Pellegrino relates, in minute by minute detail, two horrendous events of sudden human immolation. One, of course, was the explosion of Vesuvius, where humans caught in the hot lava were completely vaporized in a fraction of a second. But he also finds personal stories. Using scrolls encased in lava - on which the burnt ink can now be distinguished from burnt parchment through the miracle of Photoshop - we learn the story of a freed Roman slave girl named Justa who was trying to avoid being returned to slavery by conniving lawyers. 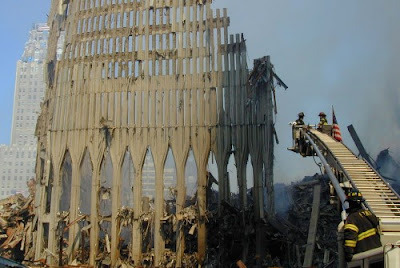 The other was the collapse of the World Trade Center towers on September 11, 2001. Pellegrino was one of the scientists who, in the months after the attack, studied how the towers fell. He has documented some of the surprising twists of horror and luck endured by the victims of that attack. In both stories there are moments where complete destruction is found side by side with items that have barely been touched. Tables set for upcoming meals remain just as they were while only a few feet away walls crumbled and fell. People inexplicably survive the massive explosions, comparable in strength to nuclear bombs, by accidentally finding themselves inside "shock cocoons": spots where some trick of the crumbling architecture and explosive physics offers a shell of protection from certain death. Had these individuals been standing a few feet away, death would have been certain. Ultimately, Ghosts of Vesuvius is about sudden destruction: a huge asteroid carving out the Yucatan in the Gulf of Mexico destroying the dinosaurs; a volcano in 1628 B.C. obliterating the Minoan civilization and giving us our legend of Atlantis; the bombs at Hiroshima and Nagasaki; an earthquake and its tsunami. In each of these and many other cases, there was some morning, probably a beautiful morning, when life simply came completely to a halt. There was no warning whatsoever. And when such catastrophe does happen again there will probably be no way to prevent it. A few lucky people might survive. The rest of us need to enjoy each beautiful morning as it happens. You can visit the ruins of Pompeii via Google Street View. Here's an Italian website devoted to the excavations and another at the Field Museum. Certain instruments, a violin, say, or a guitar, have specialized varieties which become associated with particular people, usually a performer or maker. Think of a Stradivarius, say, or a Les Paul. It is less common for a whole family of instruments to be named after a person. The saxophone was named for its inventor Adophe Sax. Less memorable is the sarrusophone, named for Pierre-Auguste Sarrus. Another instrument which bears the name of its creator is the theremin. The theremin was invented in the 1920s by the Russian Léon Theremin. A theremin, of course, is a type of electronic music synthesizer. A thereminist never touches the instrument during performance. Instead there are two antennas which can sense changing distance of the performer's hands. One hand controls pitch, the other controls volume. Judging by a host of YouTube videos, achieving precise intonation on a theremin is not easy. Vibrato and portamento cover many sins. I discovered, via the biography Stalin by Edvard Radzinsky, that the life and other inventions of Leon Theremin were far more interesting than the music created on his namesake. The young Theremin, after studying both music and engineering, sided with the Bolsheviks in 1917. As a Bolshevik engineer, Theremin bombarded Lenin with ideas. In the collected works of Lenin there is a letter to Trotsky dated April 4, 1922: "Discuss the possibility of reducing guard duties of Kremlin Kadets by introducing electric signal system. An engineer called Theremin showed us his experiments in the Kremlin." 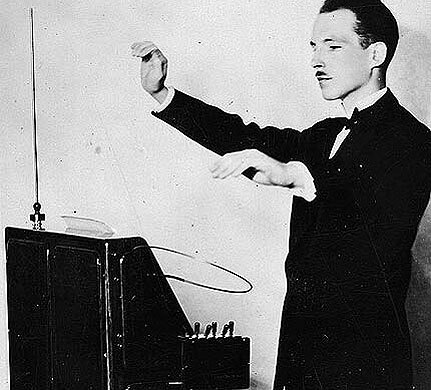 Theremin had invented his electrical "Radio Sentry." It was immediately put on the secret list and installed in the State Bank. Lenin himself played a tune on a theremin after it was introduced in 1921. The instrument was a hit and the inventor became a rich, international star. In the thirties Theremin also invented an electronic cello and drum machine. People called [Theremin] a "second Trotsky" because he threatened to carry out a "world revolution in music" with his instrument. Next, [Soviet Intelligence Director] Yagoda dispatched him in the full blaze of his glory to America, where he was to cooperate with the GPU [the Secret Police], and regularly pass on interesting information to the embassy. So Leon Theremin was a Soviet spy. But in 1938 Theremin was recalled to Russia and arrested. People assumed that he had been executed. Instead he was given a sentence of eight years. He was quickly transferred from a normal prison camp to a sharashka. This was one of [Stalin's] most impressive inventions: a closed research institute in which imprisoned scientists could continue their work. Theremin helped the great Korolev and the famous Tupolev, both prisoners, to develop a radio-controlled, pilotless plane. Then he was taken to another sharashka, where he developed a unique system of remote eavesdropping. This system was called the "Snowstorm," and it earned its incarcerated inventor a Stalin Prize. This eavesdropping invention is the most interesting of all. It was a passive radio-controlled listening device. 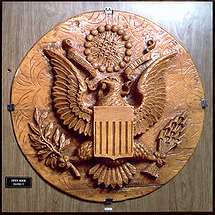 The Soviets secretly installed it in a large replica of the Great Seal of the United States which had been carved by some Soviet boy scouts. In 1945 this was presented to the U.S. Embassy in Moscow as a symbol of friendship. The naive Americans hung it in the ambassador's study. It was only discovered by accident seven years later. The trick of Theremin's invention was that the "bug" didn't need a battery or wires. It was completely inert until activated by precisely tuned microwaves beamed from outside. Then it served as a radio transmitter. Had it not been discovered it might still be working to this day. Read more at Wikipedia about The Thing. More interesting is this article, The Great-Seal Bug. Theremin's technology of snooping should be plenty familiar to all of us today. It became the basis of RFID - Radio Frequency Identification, a common tool of modern capitalism, used for asset management, product tracking and electronic article surveillance. Yep, the next time you accidentally walk out of the store with an item you picked up, thank Leon Theremin for the alarm which reminds you to pay. Of course spying at U.S. Embassies in Moscow did not stop in 1952. Here's a 1987 N.Y. Times article New U.S. Embassy in Moscow Is Said To Have Wiretaps. There's a movie Theremin - An Electronic Odyssey, which you can watch here. Here's video of a Russian photo scanner and photo-editing software, 3 years before Photoshop 1.0 was released.